WASHINGTON, D.C.—Israel’s blockade of Gaza—where trapped Palestinians for the past seven weeks have held nonviolent protests along the border fence with Israel, resulting in scores of dead and some 6,000 wounded by Israeli troops—is one of the world’s worst humanitarian disasters. 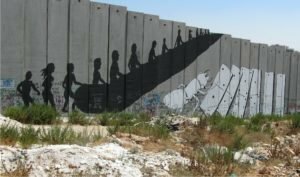 Yet the horror that is Gaza, where 2 million people live under an Israeli siege without adequate food, housing, work, water and electricity, where the Israeli military routinely uses indiscriminate and disproportionate violence to wound and murder, and where almost no one can escape, is rarely documented. Max Blumenthal and Dan Cohen’s powerful new film, “Killing Gaza,” offers an unflinching and moving portrait of a people largely abandoned by the outside world, struggling to endure. “Killing Gaza” will be released Tuesday, to coincide with what Palestinians call Nakba Day—“nakba” means catastrophe in Arabic—commemorating the 70th anniversary of the forced removal of some 750,000 Palestinians in 1948 by the Haganah, Jewish paramilitary forces, from their homes in modern-day Israel. The release of the documentary also coincides with the Trump administration’s opening of the new U.S. Embassy in Jerusalem. Because of Nakba Day and the anger over the transfer of the embassy to Jerusalem, this week is expected to be one of the bloodiest of the seven-week-long protest that Palestinians call the “Great Return March.” “Killing Gaza” illustrates why Palestinians, with little left to lose, are rising up by the thousands and risking their lives to return to their ancestral homes—70 percent of those in Gaza are refugees or the descendants of refugees—and be treated like human beings. Cohen and Blumenthal, who is the author of the book “Goliath: Life and Loathing in Greater Israel,” one of the best accounts of modern Israel, began filming the documentary Aug. 15, 2014. 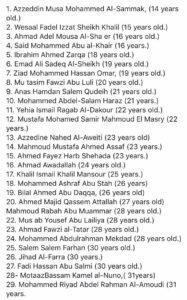 Palestinian militias, armed with little more than light weapons, had just faced Israeli tanks, artillery, fighter jets, infantry units and missiles in a 51-day Israeli assault that left 2,314 Palestinians dead and 17,125 injured. Some 500,000 Palestinians were displaced and about 100,000 homes were destroyed or damaged. The 2014 assault, perhaps better described as a massacre, was one of eight massacres that Israel has carried out since 2004 against the 2 million Palestinians in Gaza, over half of whom are children. Israel, which refers to these periodic military assaults as “mowing the lawn,” seeks to make existence in Gaza so difficult that mere survival consumes most of the average Palestinian’s time, resources and energy. The film begins in the Shuja’iyya neighborhood, reduced to mounds of rubble by the Israelis. The wanton destruction of whole neighborhoods was, as documented by the film, accompanied by the shooting of unarmed civilians by Israeli snipers and other soldiers of that nation. The film includes a brief clip of young Israelis in Tel Aviv celebrating the assault on Gaza, a reminder that toxic racism and militarism infect Israeli society. Terrified Palestinian families huddled inside their homes as Israel dropped more than 100 one-ton bombs and fired thousands of high-explosive artillery shells into Shuja’iyya. 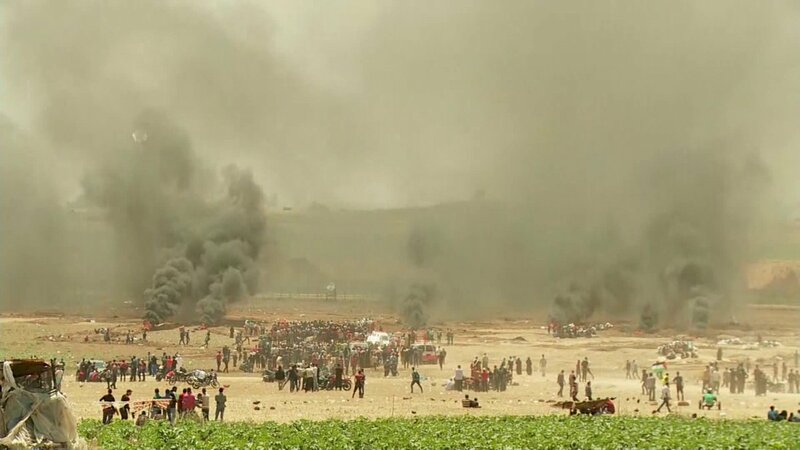 Those who tried to escape in the face of the advancing Israelis often were gunned down with their hands in the air, and the bodies were left to rot in the scorching heat for days. Shamaly, who hid wounded in his house for four days, was fortunate. His 23-year-old cousin, Salem Shamaly, who led a group of volunteers from the International Solidarity Movement to dig bodies out of the ruins in Shuja’iyya, was not. The film shows Shamaly wounded on the ground, barely able to move and crying out in pain. Starting Tuesday, May 15, “Killing Gaza” can be seen at Vimeo On Demand. The Rjeila family, including 16-year-old Ghadeer, who was physically disabled, attempts to escape the shelling. As a brother frantically pushes Ghadeer in her wheelchair (the scene, like several others in the film, is reconstructed through animation), the Israelis open fire. The brother is wounded. Ghadeer is killed. The camera pans slowly through demolished houses containing blackened human remains. Walls and floors are smeared with blood. Ahmed Awwad, a Palestinian Red Crescent volunteer, describes what happened after he and other volunteers finally receive permission from Israeli forces to retrieve bodies from Khuza’a. They find a man tied to a tree and shot in both legs. One of the volunteers, Mohammed al-Abadla, gets out of a vehicle and approaches the tree. When he switches on his flashlight, which the Israelis had instructed him to do, he is shot in heart and killed. That’s one and a half bullets for every man, woman and child in the Gaza Strip. There is footage of Israeli soldiers in an artillery unit writing messages, including “Happy Birthday to Me,” on shells being lobbed into Gaza. The soldiers laugh and eat sushi as they pound Palestinian neighborhoods with explosives. Rafah is a city in Gaza on the border of Egypt. The film makes it clear that Egypt, through its sealing of Gaza’s southern border, is complicit in the blockade. 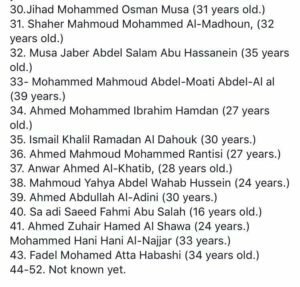 Rafah was one of the first cities targeted by the Israelis. When Israeli troops took over buildings, they also kidnapped Palestinians and used them as human shields there and elsewhere, forcing them to stand at windows as the soldiers fired from behind. Israel intentionally targeted power plants, schools, medical clinics, apartment complexes, whole villages. Robert Piper, the United Nations Coordinator for Humanitarian Aid and Development Activities, said in 2017 that Gaza had “a long time ago” passed the “unlivability threshold.” Youth unemployment is at 60 percent. Suicide is epidemic. Traditional social structures and mores are fracturing, with divorce rising from 2 percent to 40 percent and girls and women increasingly being prostituted, something once seen only rarely in Gaza. Seventy percent of the 2 million Gazans survive on humanitarian aid packages of sugar, rice, milk and cooking oil. The U.N. estimates that 97 percent of Gaza’s water is contaminated. Israel’s destruction of Gaza’s sewage treatment plant means raw sewage is pumped into the sea, contaminating the beach, one of the very few respites for a trapped population. The Israelis did not even spare Gaza’s little zoo, slaughtering some 45 animals in the 2014 assault. The film shows Palestinians, who have received little reconstruction aid despite pledges by international donors, camping out amid the ruins of homes, gathered around small fires for heat and light. Moeen Abu Kheysi, 54, gives a tour of the smashed house he had spent his life constructing for his family. He stops when he comes upon his 3-month-old grandson, Wadie. His face lights up in delight. Chris Hedges, author, spoke at a Revolution Books Town Hall Meeting at Ethical Culture Society January 13, 2009 condemning Israel and US complicity in Israel's murderous destruction of Gaza. I don't know why Trump thinks it's his right to declare other countries capitals, Bit like Kim Jong Un declaring Dallas the capital of Mexico really.